Jan 22nd. John Cocking and Will Noble. 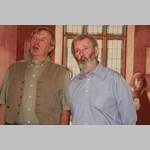 John Cocking and Will Noble have been singing together for over twenty five years and they take delight in songs from their beloved Yorkshire, many of which have been handed down to them through the generations. It has been said that they are two honest singers singing honest songs and, after hearing them, I am sure you will agree. There will be plenty of opportunity to join in the choruses. Also look out for John’s monologues as they often reduce the room to fits of laughter.